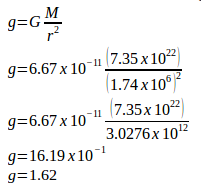 What is the acceleration due to gravity at the Moon’s surface? R = Earth’s radius. At R above Earth’s surface = at 2R above Earth’s center. At R above Earth’s surface, the acceleration due to gravity = ¼ g. If g = 9.8 m/s2, at R above Earth’s surface, acceleration due to gravity = 2.45 m/s2.